Naked Scientist Connie Orbach won a meteorite and so Graihagh Jackson made it her mission to find out as much as possible about it. But first, how did Connie get it in the first place? 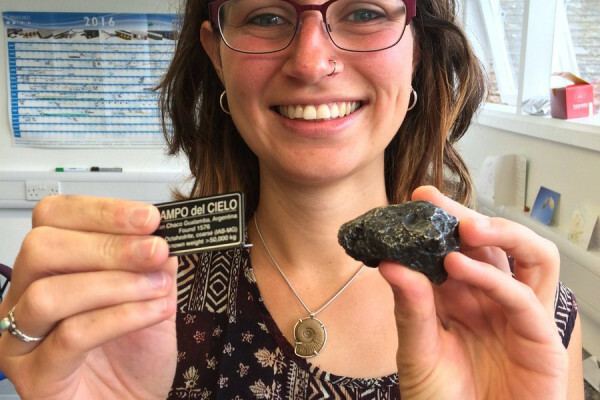 Connie - I'm not going to lie, I've never wanted a meteorite before, but now I have one I'm incredibly happy. Graihagh - And it's come on quite a journey to get here because we have been waiting in the office for weeks in anticipation of this meteorite. Connie - I think I'd say over two months - it's been a long time! A long time coming, yeah. So I won it; it was an incentive to fill in a feedback form. I never win anything and then I got an email eight months later, I think probably (I'd forgotten about it completely) saying I'd won the meteorite. Amazing! And so they said it would take a while because they said "we have to order it". And I said "where from, do you order it from space?" How do you order a meteorite in this day and age? But no, I think they just ordered it from the meteorite store which, apparently, exists somewhere. Then it arrived but I wasn't here. Graihagh - Oh yes, that's it - I'd forgotten! It arrived in a box and me and Georgia were like 'the meteorites here!' We sent you a message didn't we? An instant message pretending to open the package. Graihagh - About an inch long, isn't it? Connie - Yeah, yeah, about an inch long, half an inch wide and kind of bumpy. It's black but with a silver kind of tinge to it when you look at it in the light. And the thing that really strikes you when ou get this it it's really, really heavy. Graihagh - Yes, I'm still shocked. I mean, even though we were pretending to open it I'm still shocked. I thought it was packaging that made it how heavy that is. I think that's maybe a kilo, maybe? Connie - You think? It's definitely at least a bag of sugar so that's how I'd do my measurements, so it's at least half a kilo. And it feels like a visual illusion every time you're holding it, I think, because it just doesn't match up but my brain thinks something is wrong! And the other thing it came with is a lovely little sign telling me this about it. Graihagh - Dare you pronounce what it says? Connie - So obviously, I'm fluent in Spanish - Campo del Cielo. Connie - From Gran Chaco - oh this is tricky - Gran Chaco Gualamba, Argentina. Found - and so this is how I know they didn't order it from space - found in 1576. It's really old! I mean it's space rock so it's really old, but it's really old to this world too which I thought was quite amazing. And then it's kind of got what it's made of and the main thing is iron and that's why it's so heavy. And probably, I should have filled this in by now but there's an empty box where someone didn't know what do. It's says specimen weight but it doesn't say the answer so we can't tell you, we just have to guess by bags of sugar! Graihagh - Do you know anything more about it? I mean I'm thinking, meteor, meteorite, comet. I'm not entirely sure I know where these things overlap. Connie - I have no idea. Graihagh - Given we've all been so excited, none of looked anything more into it. Connie - No, not at all. I was just excited I was getting a meteorite but, actually, probably not sure what that is! I just know it's space rock of some sort. Graihagh - OK it's your birthday soon, so I'm going to make it my mission to find out as much as I can about this rock. Connie - Yeah, two weeks. So you've got two weeks to find out, and if you can get some form of certificate, I'll be particularly happy.